Colouring with Distress Inks Part 2 Hair. We all want to make beautiful cards to send to family and friends, and sometimes the effect we want can be achieved quite easily using your Distress Inks. There are lots of colours in these inks and so it is easy to achieve the look you want whether for characters, florals or landscapes. This series of videos has been made to show you how to get the most from this product. Using them to watercolour is perhaps one of the easiest ways to get good results as it is such a gentle medium to use. Just by altering the blend, using different colours for your hair, will make your character blonde, brunette or redhead, and thereby altering the whole look of the card. Just to remind you that I have used a Number 2 Sable Hair brush and the water colour card from Crafters Companion. With a limited palette of Aged Mahogany, Tea Dye, Walnut Stain, Tattered Rose and Forest Moss I have produced this very pretty effect on the card I have made. 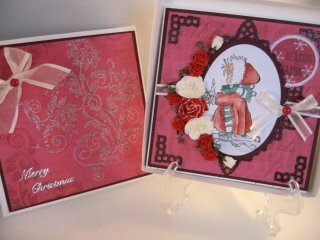 The stamped image I have used in these videos is from the SWALK collection and these are available also from Crafters Companion. There are some lovely characters to choose from and you are sure to find lots of them that you really like. So there you have the short tutorial on Colouring your characters hair, and the link to the other two parts is at the top of the page. This is such a relaxing technique to use ... so just enjoy the process and then you will create some wonderful toppers for all your cards.